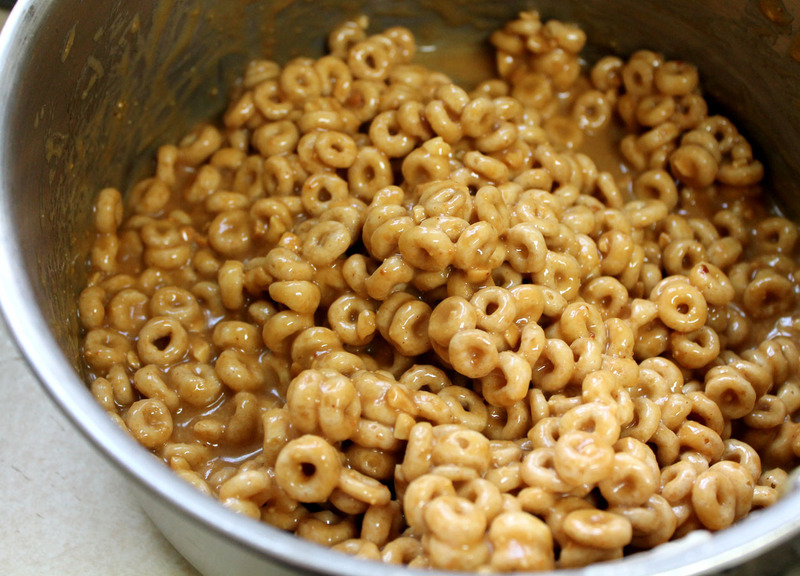 Peanut Butter Cheerio Clusters | Live. Learn. Love. Eat. You may wonder (considering the sheer volume of peanut butter recipes on this blog) if I may have a slight peanut butter addiction. The answer is a shameless yes. I don’t think that my mind will ever stop thinking up ways to use peanut butter in recipes, (I do this at night before I fall asleep). I love peanut butter, not only because it is deliciously smooth and addictive, but because it is also a good source of healthy fat and protein. I especially love that my kids love it too. If I’m ever too lazy tired to cook, there is always the good old PB sandwich on whole wheat bread to fall back on. A healthy ‘meal’ when served with a banana that I know the kids will eat. It is also affordable, which is a good thing considering how many jars we go through around here. Since peanut butter has been there for me so many times in life, I figured I owed it to peanut butter to put it in as many recipes as I can. Peanut butter deserves to be loved and eaten in amounts larger than a measly tablespoon serving (at least in my opinion anyway). When there is no one else to turn to and no one in the world who understands you, who is there? You can also never go wrong with drizzling smooth natural peanut butter over top of a big bowl of banana ice cream! That is my guilty pleasure in life. Today I tried a cute little recipe that I have been meaning to make for the girls for a long time now. 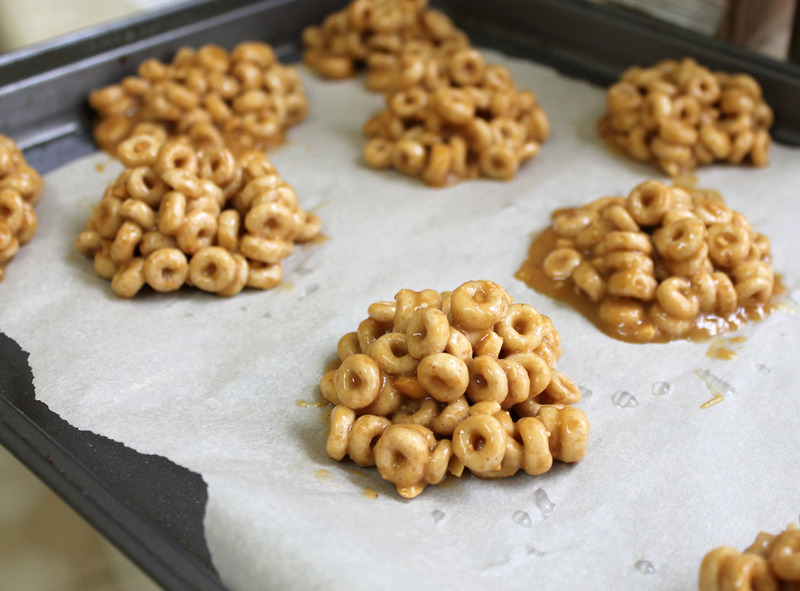 Since they enjoy Cheerios cereal from time to time, I decided to make these cute little Cheerio clusters for them to have for an afternoon snack or dessert. I of course included PB in the recipe and sweetened them with brown rice syrup in place of my original maple syrup for a little something different. Tired of Crispy Rice Squares? 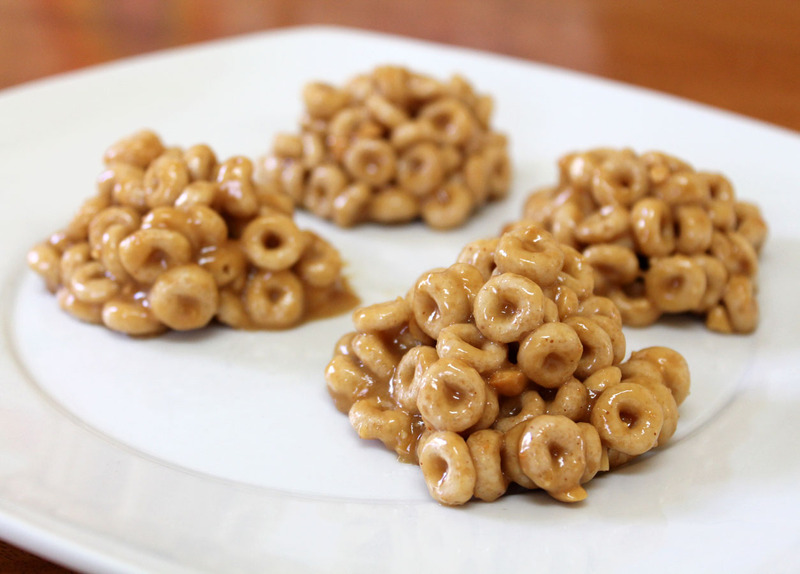 These little peanut butter clusters are a healthy and delicious kid-friendly treat! They are also fun for kids to help make since they require no baking at all. Great for the hot summer months when you still want a treat, but you don’t dare turn on the oven. Heat the margarine in a large saucepan on medium heat. Once the margarine has melted, add the brown rice syrup and vanilla and whisk until smooth and combined. Remove from the heat and add the natural peanut butter, whisking again until combined. Finally stir in the Cheerios. Allow the mixture to cool for a few minutes while you line a baking sheet with parchment paper. 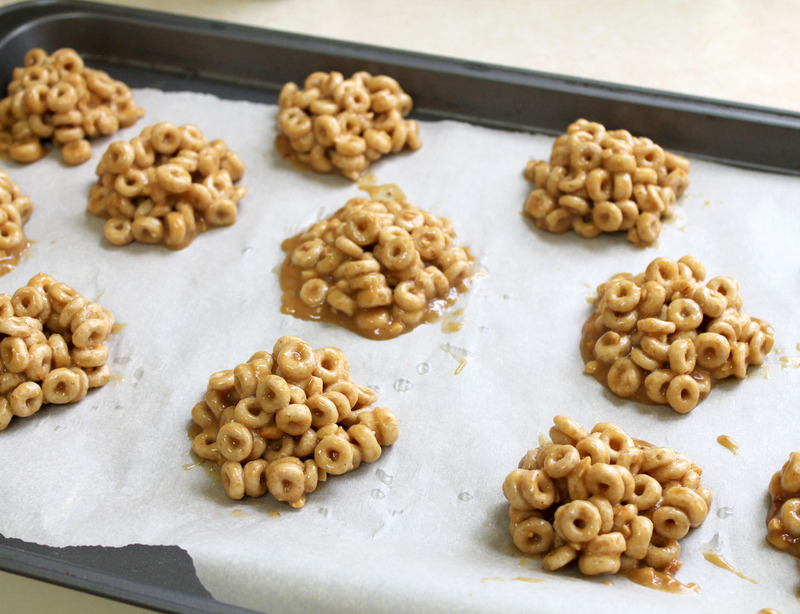 Drop the mixture by large tablespoon-sized clusters onto the parchment paper lined baking sheet. Place the baking sheet with the clusters into the fridge to set for at least 20 minutes. Once the clusters have set, they are ready to eat. Store the remaining clusters in a container in the fridge. My name is Annie and I’m a PB addict!! I love it, too. These look so fun and tasty! LOL. That is a lesson that I have learned; I must bake it into something otherwise I will just start eating it from the jar. Last night Serafina and I had the cashew butter out and we were eating it by the spoonful. I felt less bad about the fact that it wasn’t only me. She loves it! That and apple butter.